The first Superjet 100 destined for Mexican airline Interjet sits on display at the Le Bourget static park. A ceremony scheduled for this morning in Le Bourget’s static park marks delivery of the first example of a Sukhoi SSJ100 built to operate in the Western world to Mexican airline Interjet. The airplane, marketed by SuperJet International–the Venice, Italy-based Western sales and worldwide support provider for the Sukhoi SSJ100–arrived here in Interjet colors on Saturday evening. It now occupies a prominent spot on the static display line, giving show goers a preview of what passengers will experience once service starts next month. Still under Italian registration, the airplane must return to Venice for final delivery preparations before its ultimate ferry flight to Mexico. Plans call for delivery of Interjet’s second airplane, also undergoing final provisioning for delivery, to arrive a few days later. SuperJet expects to deliver both airplanes by the end of the month. Speaking with AIN a week before the show, SuperJet International CEO Nazario Cauceglia stressed not only the historic significance of the delivery but, more emphatically, the implications a successful service entry carries for Russia and the Sukhoi-Alenia partnership to which the SSJ100 program in its current form owes its existence. Originally scheduled for delivery late last year, Interjet’s first SSJ100 took roughly six months longer to prepare for Mexican operation than expected due to delays involving the interior installation, performed by SJI in Venice. 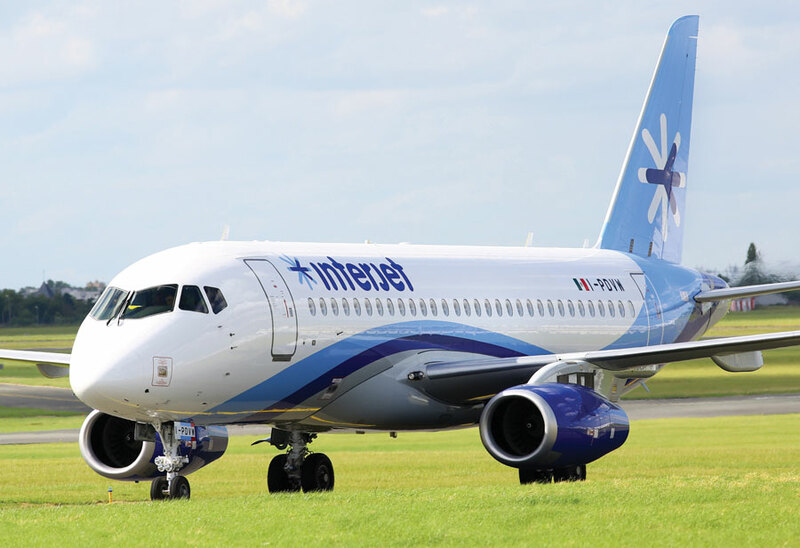 Although unwelcome and undoubtedly costly for the supplier, the delay didn’t sour Interjet’s relationship with SJI, said Cauceglia, who pushed hard to ensure the airline received the airplane in time for its busy season starting in July. Now building SSJ100s at a considerably slower rate than the three per month it had planned for this stage of the program, Sukhoi Civil Aircraft (SCAC) has nevertheless assured Cauceglia that it will meet its promise to deliver airplanes to Venice at a sufficient pace to allow SuperJet to completely fill the Mexican carrier’s firm order for 20 airplanes by the end of 2014. Meanwhile, Sukhoi has also promised Aeroflot to replace its first 10 SSJ100s with what the manufacturer calls full-configuration airplanes, the first of which it delivered on May 31. Since the start of the year it had delivered only two others, one to Indonesia’s Sky Aviation and the other to Lao Central Airlines in Laos. In February 2012 the SSJ100 became the first ever Russian model categorized as a “large airplane” to achieve EASA CS-25certification, allowing it to operate in Western Europe in countries that use EASA regulations as their reference standard. The European agency two weeks ago certified the new interior installation conceived by Italian design house Pininfarina and just last week issued an export certificate for delivery to Mexico. In an interview with AIN last summer, Interjet CEO Jose Luis Garza said route planners had identified some 80 city pairs suitable for the airplane, many formerly served by Mexicana Click Fokker 100s and Boeing 717s and all within the 925-nm range the SSJ100 can manage from the hot-and-high international airport in Toluca, Mexico (8,466 ft msl). Because calculations showed the original-standard SSJ100 could fly only as far as 750 nm from Toluca, Sukhoi developed an extended-range variant using high-speed landing procedures and a modified landing-gear door designed to reducedrag. In addition to Toluca, Interjet plans to fly the airplanes from Mexico City, Guadalajara and Monterrey, as well as cities in the northwest and southwest of the country, said Garza. “This is going to be a workhorse for us, because utilization is going to be intense in Mexico–more than five cycles per aircraft per day,” he said. Along with its initial order for 15 of the airplanes and subsequent option conversion on another five, Interjet signed for SuperJet International’s SuperCare “per-flight-hour” aftersales program, supported by a new parts warehouse for the Americas in Fort Lauderdale, Florida. Due to open next month, the Florida warehouse augments spares capacity leased from Lufthansa Technik in Frankfurt and a facility at Sheremetyevo Airport in Moscow, which serves mainly Aeroflot. As part of the deal with Interjet, SuperJet has agreed to provide on-site technical support in Mexico with a six-member engineering team during the first six months of service and a permanent field service representative on-site for three years. Back in Venice, at one of SuperJet’s training centers, more than 10 Interjet cockpit crews have earned their type ratings and four more had partially completed their training by the end of May. Forty-two Interjet mechanics and seven flight attendants had finished their courses. All told, SuperJet had trained 199 pilots, 96 flight attendants and 690 mechanics for various customers in Venice and at its other simulator-equipped training center in Moscow. Along with an SSJ100 full flight simulator, SuperJet’s Venice center operates an Airbus A320 simulator to help prepare pilots for the Russian airplane’s comparable glass cockpit. SuperJet also sells A320 simulator time to other airlines and private customers, more than 30 of which have already trained on the machine since SuperJet began offering the service last year.